I would like to say that I knit these socks because I was inspired by falling leaves, the angles of tree branches as they part from mighty oaks in a V-shape, or allude to poetry and art. But let's face it: the true driving force behind these socks was ADDICTION. There was no other way to get them off my back than to knit them. It was all very simple. I waded through my stash. I started with yarn, hand dyed in Canada, the birth place of many great yarns. I thought about shapes and angles that would work well with the variegated colors, and voila! The next thing I knew, after weeks of ripping and reknitting and ripping and reknitting (no less than four times, just ask my knitting group), I had a sock. model: Cookie A. photos: John H., Cookie A. Round 2: [P4, k8, p4] to end. Round 3: [P3, k2tog, k3, yo2, k3, ssk, p3] to end. Round 4: [P3, k5, k1 tbl, k4, p3] to end. Round 5: [P2, k2tog, k3, yo, k2, yo, k3, ssk, p2] to end. Round 6: [P2, k12, p2] to end. Round 7: [P1, k2tog, k3, yo, k4, yo, k3, ssk, p1] to end. Round 8: [P1, k14, p1] to end. Round 9: [K2tog, k3, yo, k6, yo, k3, ssk] to end. Round 11: K all sts. Repeat Rounds 1-11 for Lace Pattern. Round 1: [K1 tbl, p1] to end of rnd. Information about blocking can be found here and here. CO 64 sts. Divide evenly between needles (16 sts on each needle) and join to begin working in the round, being careful not to twist. After a few rounds have been worked, you may wish to place a split ring marker or safety pin in work to indicate beginning of round. Work in Twisted Rib until work measures 1 inch. Work Rounds 1-11 of Lace Pattern 6 times. First Set-up Row: K16; turn work so that WS is facing. Second Set-up Row: [Sl 1, p31] onto 1 needle. Heel flap will be worked back and forth on these 32 sts; remaining 32 sts on hold for instep. Row 1 [RS]: Sl 1, k31. Row 2 [WS]: Sl 1, p31. Repeat these 2 rows 14 times more. There will be 15 slipped sts along each side edge of the heel flap. 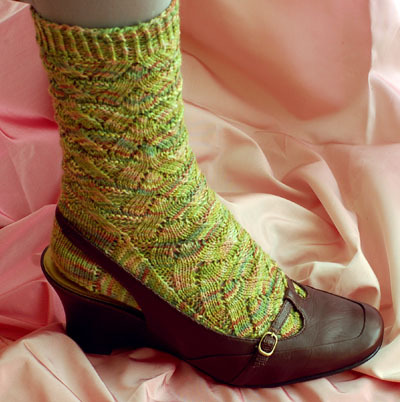 Note: If you have a large instep, you may wish to work a longer heel flap, to add height to the foot of the sock. If you do this, be sure to work more gusset decrease rounds accordingly. Row 1 [RS]: K17, ssk, k1, turn work. Row 2 [WS]: Sl1, p3, p2tog, p1, turn work. Row 3 [RS]: Sl1, k4, ssk, k1, turn work. Row 4 [WS]: Sl1, p5, p2tog, p1, turn work. Row 5 [RS]: Sl1, k6, ssk, k1, turn work. Row 6 [WS]: Sl1, p7, p2tog, p1, turn work. Row 7 [RS]: Sl1, k8, ssk, k1, turn work. Row 8 [WS]: Sl1, p9, p2tog, p1, turn work. Row 9 [RS]: Sl1, k10, ssk, k1, turn work. Row 10 [WS]: Sl1, p11, p2tog, p1, turn work. Row 11 [RS]: Sl1, k12, ssk, k1, turn work. Row 12 [WS]: Sl1, p13, p2tog, p1, turn work. Row 13 [RS]: Sl1, k14, ssk, k1, turn work. Row 14 [WS]: Sl1, p15, p2tog, p1, turn work. 18 sts remain. Row 15 [RS]: K9. Proceed to gusset. 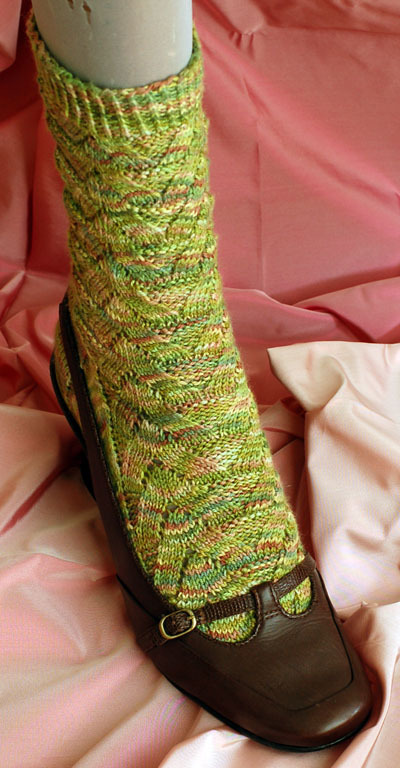 Working yarn is currently located at center of heel; this point wll be beginning of round for gusset, foot and toe. When working Round 1 of gusset, needles will be designated Needle 1, Needle 2, etc. They will retain these designation throughout rest of sock. Round 1: Using Needle 1, k remaining 9 sts of heel flap, pick up and k 15 sts along side edge of heel flap (1 st in each slipped st) and 1 st between top of heel flap and held instep sts; using Needles 2 and 3, k 32 instep sts (Row 1 of Lace Pattern); using Needle 4, pick up and k 1 st between instep sts and top of heel flap, pick up and k 15 sts along side edge of heel flap, k remaining 9 sts of heel flap. 82 sts: 25 sts each on Needles 1 and 4, 16 sts each on Needles 2 and 3. Round 2: K9, k14 tbl, k2tog; work Round 2 of Lace Pattern over sts on Needles 2 and 3; ssk, k14 tbl, k9. Round 3: K to end of Needle 1; work next round of Lace pattern over sts on Needles 2 and 3; k to end of Needle 4. Round 4: K to last 2 sts of Needle 1, k2tog; work next round of Lace pattern over sts on Needles 2 and 3; ssk, k to end of Needle 4. Repeat Rounds 3 and 4 seven times more. 64 sts; 16 sts on each needle. Continue in pattern as set, working sts on Needles 1 and 4 in stockinette st and sts on Needles 2 and 3 in Lace Pattern, until work measures approx. 1.5 inches less than desired length, ending with Row 1, 10, or 11 of Lace Pattern. 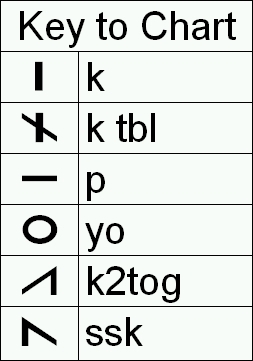 Decrease Round: K to last 3 sts on Needle 1, k2tog, k1; k1, ssk, k to end of Needle 2; k to last 3 sts on Needle 3, k2tog, k1; k1, ssk, k to end of Needle 4. Repeat these 2 rounds 8 times more. 28 sts remain. Using Needle 4, k to end of Needle 1. Slip sts from Needle 2 to Needle 3. Graft sts on Needle 3 to sts on Needle 4. Cookie is a knitting addict living in Northern California. She is particularly prone to sock yarn impulse purchasing and knitting, has a darling cat named after a mathematician, and is in search of the most whack haircut ever. 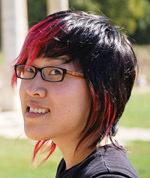 She co-blogs on Knitters Anonymous and will set up a website one of these days.